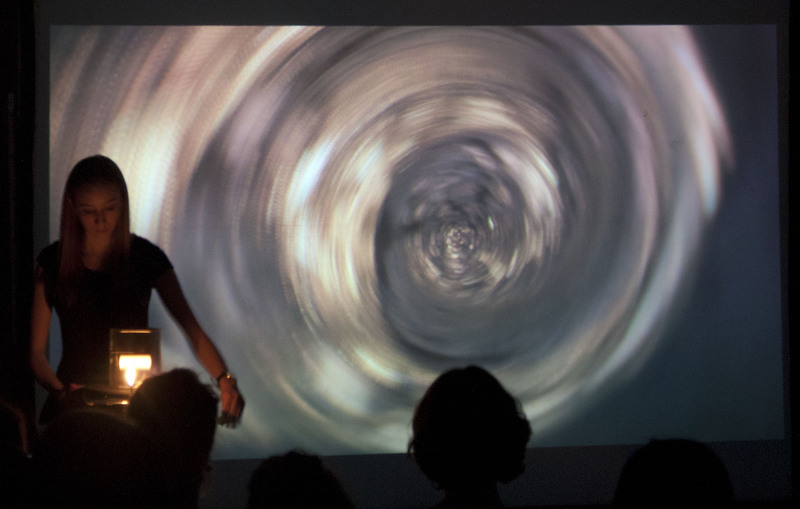 The first of two Unconscious Archive events with the title The Perfect Medium is the Wrong Message was presented at Café OTO, Dalston, to a packed house. The evening, curated by Sally Golding and James Holcombe, comprised a mixture of Hallowe’en themed performances by Aura Satz, Sally Golding, Malcolm LeGrice, Amy Dickson and ‘Sir Gideon Vein’. Perhaps one way to discuss the work shown is in terms of ‘Paracinema’ a term first coined by the US filmmaker Ken Jacobs and more recently developed and theorised by the critic and teacher Jonathan Walley in relation to work made by the filmmakers Anthony McCall and Tony Conrad in the 1970s. Walley proposes a kind of ‘cinema’ based around the fundamentals of light and time, and not necessarily those components such as celluloid, which have usually been considered indispensible to what we understand cinema to be. The other linking themes were fire, deployed in two of the works, and screens, which functioned as interrupted and uninterrupted surfaces, and as veils. The purest para-cinematic work of the evening was Amy Dickson’s Light Time, in which she creates a time-based event by lighting candles placed in five rows of five behind a dark thermochromic screen. The candles are lit one by one then extinguished. The duration is variable, as are the effects, in which areas of the screen lighten as they are heated by the candles. The flicker of the candle flames is visible as well as the whitened areas, such that different speeds of movement and change are simultaneously visible: the candles flicker at ‘normal speed’, while the heated areas change slowly, taking longer to return to black after the candle has been extinguished than they take to whiten when they are lit. The areas at the top of the screen are larger, presumably because the heat rising from below increases the effect. 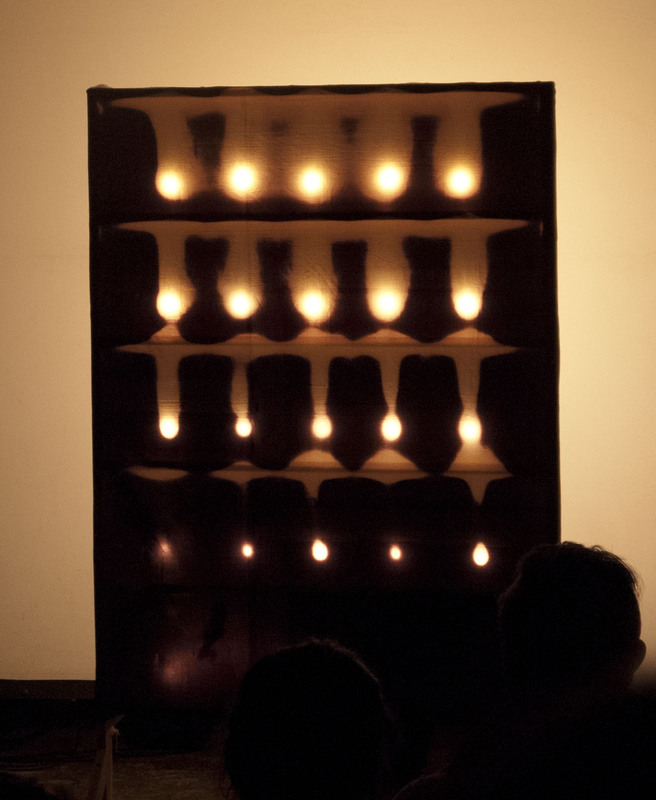 A third temporal element is Dickson’s performance itself, which is ultimately limited by the time it takes to light and extinguish the candles, but which usually takes longer than this. The complex mix of temporalities recalls some of David Hall’s TV Interruptions (1971), in which time-lapse, real time and static elements are effectively co-present. Malcolm LeGrice’s Horror Film 1 (1971) could also be said to be para-cinematic. Like Tony Conrad’s Pickled 3M 150 (1974), for which Conrad pickled some 16mm film, and Anthony McCall’s Long Film for Ambient Light (1975), a work consisting of an empty room lit by daylight in the day and electric light at night, it references cinema while vigorously opposing its technical-industrial norms. 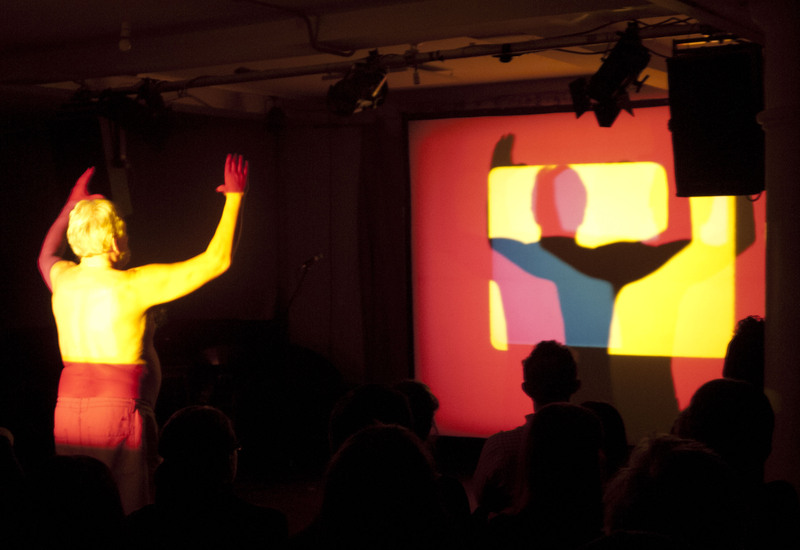 Three projectors are used, but they carry loops of pure colours, that is, minimally ‘filmic’ material. 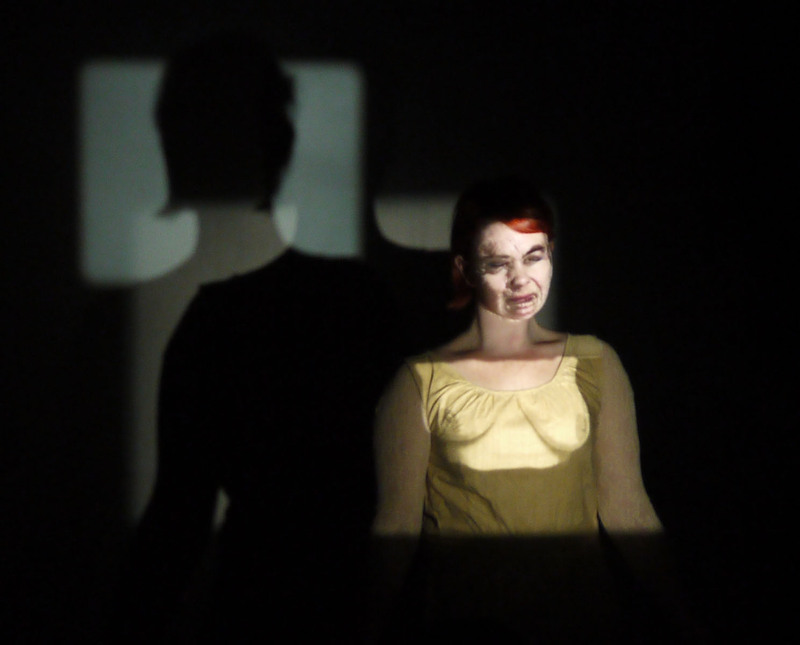 Thus there are no images as such, but LeGrice’s interactions with the projections bring performance, pulsating light, colour and sound (of the projectors) into dramatic conjunction, focused on the screen as multi-coloured shadow-play. Most of the elements of narrative cinema are present; projectors, film, an actor, a performance, time, sound and a structure with a beginning middle and end, yet the end result is as unlike a conventional movie as it’s possible to imagine. Horror Film 1 remains one of LeGrice’s simplest, most elegant and dramatic works in a series of meta-cinematic studies that he made through the late 1960s and early 70s. In Sally Golding’s Face of An Other faces and torsos are precisely projected onto the artist’s face and body to produce what at times looks like a kind of virtual veil, while at other moments seems to transform the artist’s face in more or less grotesque ways. The illusionism of the work has been transformed in a more complex and abstract way in her more recent performances, where the image is pulverised by the use of strobe light and other elements that supplement the projected images. Aura Satz’s film-performance Sound Seam combined extreme close up images of records being cut on a cutting lathe, with a collage of ghostly recorded voices. At the side of the screen Satz manipulated a hand-cranked 78 rpm record player on which was placed a glass box containing a candle. The work wove rotational graphic images with the flickering of real fire and whispered voices to generate a range of ethereal effects.